Are you throwing an Oscar party this weekend? I know just how much the Fiesta Friday gang loves to party, so, I figured I would whip up something fit for the celebrity buffet table, in case you were!! This recipe would be perfect! It’s so quick and easy to make and it is very elegant. It would fit right in beside the champagne and caviar that I know you will be feasting on while you watch the stars collect their Oscars! Even if you’re not into the Hollywood glitz, this makes a nice little appy for any occasion. You can kick up the heat factor by adding more curry paste than the recipe calls for, or if you prefer red curry paste, I’m sure you could substitute it. 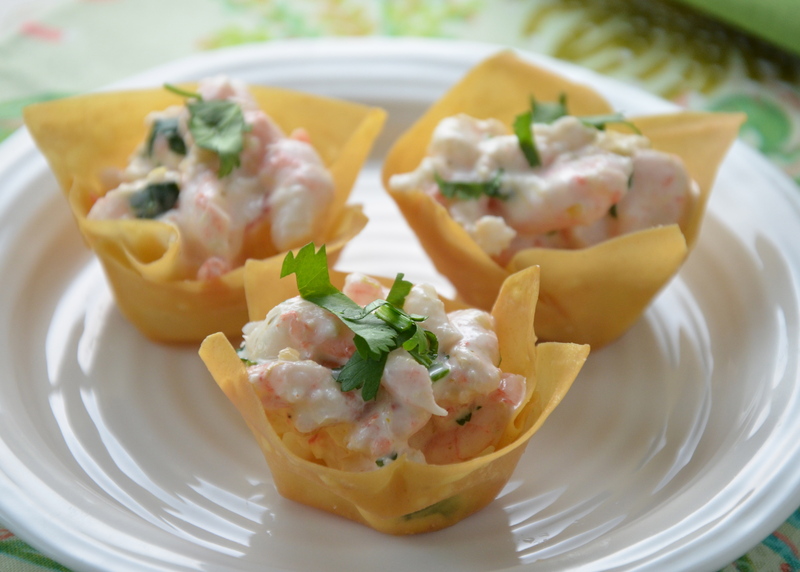 If you have never made wonton cups, let me assure you, this is a snap! I had never made them before, but now my head is swimming with all sorts of ideas for future appetizers using these versatile little cups. This recipe comes from the October 2001 issue of Bon Appétit. So, if you haven’t visited Angie’s Fiesta Friday yet, you have to check it out! We are indulging ourselves in some amazing food and mingling in very fine company! Place wonton wrappers on a work surface and brush lightly with oil. Press into miniature muffin cups, oiled side down. Bake until golden, about 6 minutes. Whisk mayonnaise, cilantro, lime juice, chutney, curry paste, together in a medium bowl. Stir in shrimp. Season with salt and pepper. (Salad can be made up to one day ahead. Cover and refrigerate. Place wonton cups on a serving platter. 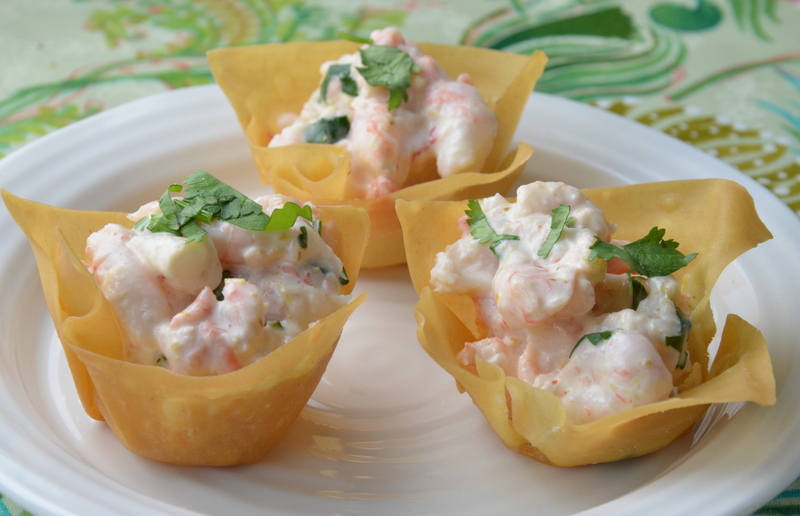 Spoon some of the shrimp salad into each cup. Garnish with more chopped cilantro. Serve with some mango chutney on the side. Great photo, great recipe! Thanks for sharing. So glad you think so! Thanks so much for stopping by and commenting! Funny you should say that! I was thinking that I would make them the next time I go to an event like that! That is so nice of you! Thanks so much for stopping by and commenting! Have a wonderful weekend! These little cups of creamy goodness are absolutely gorgeous! I’m quite certain that they taste as delicious as they look. Oh, they are pretty good. My hubby and I polished them off last night and he asked if there were any more!! Yes, you should come to Fiesta Friday -I have seen some beautiful dishes on your site that you could bring. Hope to see you there! LOL, Sadia! I think your gourmet molton lava cakes win the prize for gourmet beauty and style! Oh, yum, yum, yum! Favorite flavor overload here. LOL! That’s what I was saying as I was gobbling them down! These are lovely! Don’t you love to look through “old” Bon Appetit magazines? It so interesting to see food fashion from the past. Yes, I really do. I used to have boxes of them, but I recently tore out all of the recipes I thought that I might make and put them all into page protectors and then into binders. Does that make me a foodie nerd or what? Thanks for stopping by. Have a wonderful weekend! Oh my gosh, you are so organized. I need to do that very thing. I have a stacks of torn magazine pages needed a binder! foodie nerd….yes! So here’s to being foodie nerds!! 🙂 I hope your project goes well! Well, thanks so much! So nice of you! OMG, you read my food cravings! 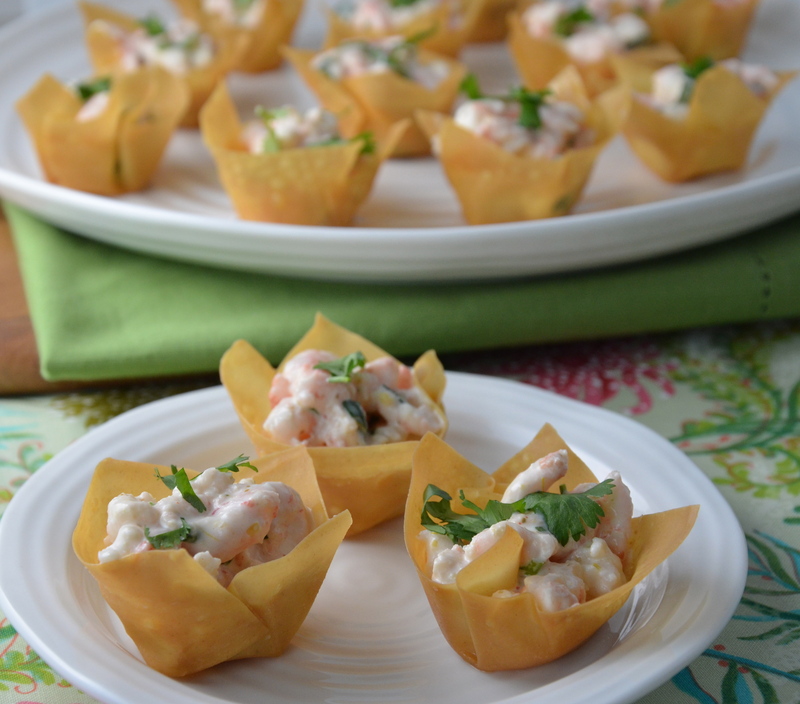 I was just telling my husband the other night that I wanted to make wonton cups filled with shrimp and mango–no joke! He can testify to this. I bet the fresh lime and cilantro really pop in this salad too. This is a great dish to bring to the party! LOL! You know, I totally believe you! I swear that there must be some weird blogger telepathy . A few weeks ago I was planning to make preserved lemons and was about to search it on the web. I quickly looked in my WP reader before googling and almost the first post was about preserving lemons! It was so weird!! But, yes, the lime and cilantro really make these flavours pop. I hope you try this recipe. Have a great weekend! These look absolutely delightful! What a great combination – mango and shrimp! And love the idea of making cups with the wonton wrappers! Terrific! So glad this appeals to you. I know, the little wonton cups are a lovely revelation to me. I plan to stuff them with all sorts of things in the future 🙂 Have a wonderful weekend! Ah yes – These would be perfect for nibbling along with some cocktails 🙂 I’m thinking something pink, pretty and bubbly…Hmmmm. Thanks again so much for throwing this Friday night soirée! You are the hostess with the most – ess! These are adorable, Julianna! The wonton wrappers look so crisp! Thanks so much Patty! It’s so much fun when we discover new ways of preparing things. I’m going to fill these little guys with other things the next time I have people over! I hope you have a lovely weekend! Yes, exactly what I was thinking as I was munching away on them while taking the pictures! 🙂 Cheers! Thanks Serena! I appreciate your comment. Have a wonderful weekend! this looks absolutely delicious and the presentation is beautiful, I love the idea of shaping the wontons in muffin pans, that’s clever! I want to try that 🙂 thank you for the nice post, Julianna! You’re so welcome! I hope you get a chance to make the wonton cups. Honestly you could put so many different things in them! Thanks for taking the time to stop by and comment; I appreciate it. Love prawns and mango, but I’ve never had them together. Bet these were delicious. And those wonton cups are so good for appetisers. Really nice idea. OMG! Prawns and mango are like hand in glove! Wait till you try it and let me know when you do – your taste buds will be singing! Thanks so much, Fae! You will have to let me know what kinds of fillings you are going to create! I can’t wait to hear what you do, because you are so creative!! Have a lovely weekend, by the way. Well, thanks so much for stopping by and taking the time to comment! They are yummy and super quick to make! The photos and presentation is excellent. I would love a serving! Thanks Liz, I wish I could just send you over a little plate! Thanks so much for the compliment! I really appreciate it!